During our second week we were asked to volunteer at The Met school, a magnet school. 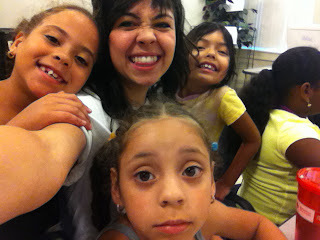 Every year they have a summer camp so we were asked to Mentor 6 year-olds, and boy did I get attached! We spent every single day from 9 am -4 pm with the same group of kids. The theme for the camp were species in danger, one of the days we learned about siberian tigers so we made tiger masks and during recess we all ran around pretending to be tigers! It was fun and exciting to feel like a kid again! In the beginning of my time here I was determined to work on art, so I bought 9 small canvases to continue my fetus series. I bought printed fabric from a thrift store and stretched the canvases with the fabric. And above is the result! I also found out through a friend from CityArts that RISD has a Nature Lab, where they have dissected animals which is now one of my favorite places! One of the first weekends I went and pretended to be a RISD student and snuck into the lab and spent about 5 hours just sketching these fetuses. This image above captivated me the most, the fetus was in such position that it made me cringe and slightly sigh. I spent a lot of time with it. This is one of the sketches that I did. I wanted to share of this with you guys since this project alone takes up a lot of my time here besides the teaching part!